I’ve been thinking a lot about presentations lately. In the course of a year, i’ll have the opportunity to impact over 10,000 people in a live presentation arena and plenty more online. Like any craft, it’s my obligation to stay abreast of what works. Yes, it is a performance (the sizzle) – a presentation needs to entertain, take people on a ride, embed key messages within a narrative, treat people’s time as valuable and cater to the human need for sensorial stimulation in order for messages to sink in; too many corporate execs deny this reality or simply aren’t comfortable bringing the circus to town. Yawnnnn…. It needs to have a goal that is helpful and has lasting value for the audience (the steak) – what’s the point if you’re not inspiring, educating or teaching your audience something relevant, new and practical; too many speakers on the professional circuit miss this mark in pursuit of the personal ego stroke, promotion of their own nirvana world views or worse, laziness in not customizing their content for their audiences. Remember the presentation is for them, not you. How is technology changing the idea of presentations? 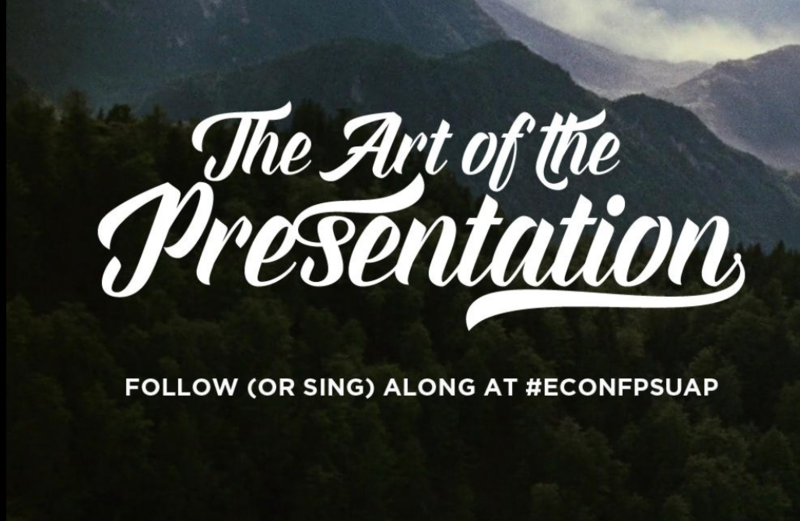 What formats make for the best presentations? Do audiences react differently to different presentations? If we are truly into “engagement”, are “people on stage” the best vehicles for that? How do I get to generate an even better reaction with my key stakeholders “the audience” before selfishly addressing my own objectives ? 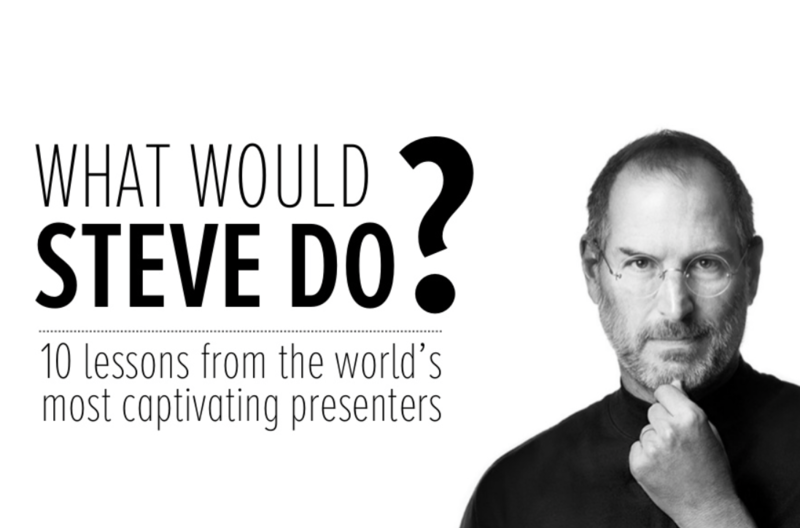 Most of the dogmatic wisdom I hear about presentations comes from the professional presenter clique themselves. Make no mistake, they give good slide. 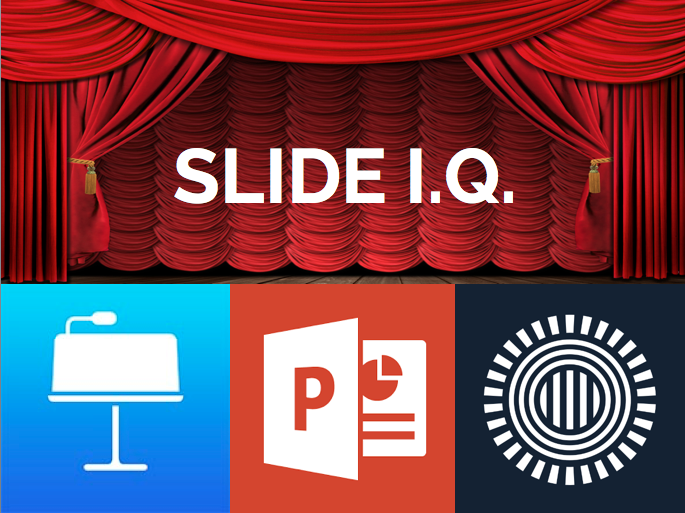 I’ve provided examples of my five best presentation sources of inspiration below. But what seems more annoyingly now more than ever, is the sameness of the well-coiffed school of slide-ology (and yes, that is a word). Conferences are spitting out highly-opinionated and rehearsed orators, they all are using the 60-90 slide, awesome background shots with one sentence prophetic statements, TED-like mantras (admission I do love TED but it’s not everybody’s thing) and “Look at me, look at me” delivery styles. Is this what we want? Are other people seeing this trend toward style over substance? Quality of visual over thinking? Narcissism over selflessness? Noble-minded opinion over well-articulated theory put into practice? So I searched for something that these presentation touring band hands would be wise to consider – evidence! 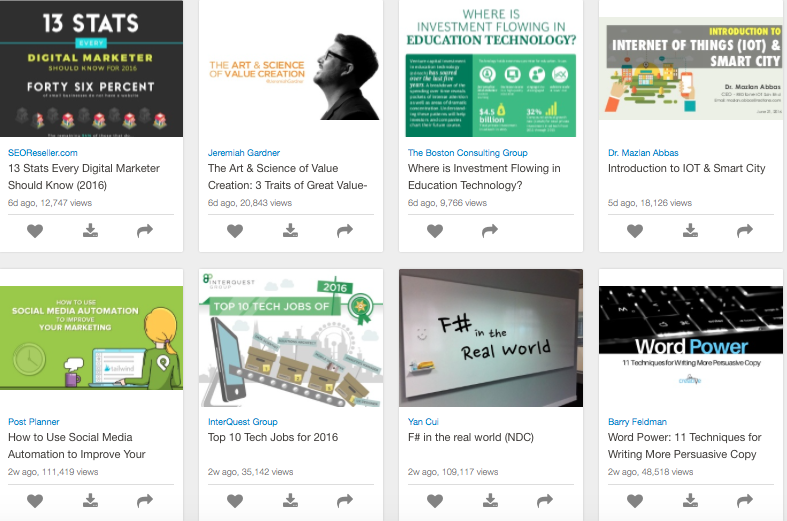 In looking at the last 30 most popular and recently popular presentations on Slideshare (I am making the presumption that a well viewed Slideshare presentation makes equally good live performance fodder). I found some interesting grains of truth. First of all, contrary to the speaker code, I noticed a large range of formats and styles amongst these viral slide hits (no dogs in the bunch – average views for these recently uploaded decks were 14k per day). Quality of Graphics: 8 presentations had truly great, likely professionally done slide work, 5 had good impactfully done slidework likely pulled together by the presenter themselves and 7 had very average looking slides (using available Powerpoint templated formats) – Verdict – although it helps and led to more social sharing, there is no standard floor for graphics in presentation impacting views or potential distribution Conclusion – spend less time developing great graphic and more time developing great ideas, provocations, arguments, evidence and results. Number of Shares: the average amount of shared activities per presentation each day on the four relevant social networks (Facebook, Twitter, LinkedIn, Google+) was 11 per day with a range of 1 to 158 Verdict: the only key skews being towards more emotional presentations (+88% shares vs. average) and higher quality of slide graphics (+49% shares vs. average) Conclusion: no golden rule for getting social sharing of your content, communicate humanly, clearly and desirably and you have a chance. So if we can’t rely on these numerical rules, what did they all have qualitatively in common? – A Central Idea – at the heart of what was being presented, there was a solid idea on what was being covered, even better communicated when in the title of the presentation. – Visual Connectedness – although some presentations were average looking, all slides looked like they came from the same parent. – Typography – if the fonts weren’t distinctive, they were all clear, bold and designed for impact. – Roadmap/Arc to their Presentations – the more effective roadmap provided, the more views presentation received – some did it through absolute slide consistency, others through a paradigm/model that guided their presentation and yet others did it through numbered lists. – Recent/Topical Experience – although some dipped into history going back 50 years for context, most of the learning was very recent and up-to-date. – Great Examples – in the majority of cases, the presenters had curated the best examples from their own experience or more likely the “world out there” to emphasize their points. – Quotes – a reasonable use and justifiably placed, set of quotations from famous/smart people to emphasize the point being made was a frequently used tactic. – Asking Questions – although not uniformly used, more than half of the decks openly asked questions, either to get people to think or to lead logically to the argument being posed. – Playful Tone – regardless of purpose of presentation (except for analysis presentations) – slide formats allowed for a bit of humour either explicitly in text or implicitly in pictures. – Call to Action – many of the presentations had a clear call to action and what they wanted their audience to do and links to contact info. So there you have it. Get the presentation police off your back and use whatever slide format you want by following these general guidelines. 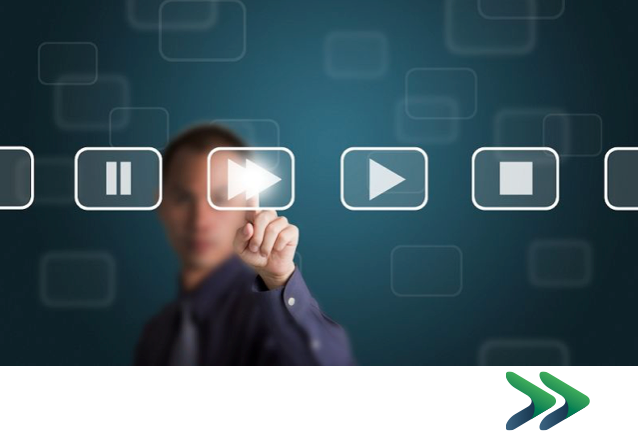 Curious to know your favourite presenter and/or presentation format? Here is the second instalment containing seven examples that point to a world that keeps getting quicker, faster and tougher to evaluate in the “Transportation” industry. As we have seen over the last 30 years, massive disruption has hit the $4 trillion transportation industry. Detroit has shrunk into a tiny version of its former self. Air travel has continued to go through the constant boom and bust based on the economy and jet fuel prices, and has yet to collectively make a profit. The developing world can’t satiate themselves fast enough for the taste of car ownership while Western-World millennials would prefer none of it. And we all need to come to grips with increasing urban traffic congestion and its environmental effects the world over. The difficulty in transportation is that when changes start to happen, they roll fast. And the lead times to catch up to that change can overwhelm companies, governments, societies and environments. 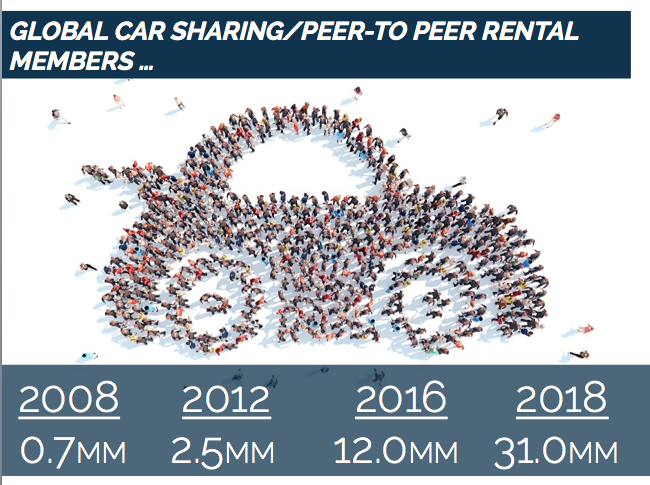 By 2020, we will have 11X more connected automobiles being produced each.year than just 8 years ago, making them the majority of cars produced by 2020. Since the 1908 introduction of the Ford Model T, we have now entered the fourth generation of cars – beyond: merely available; easy to use; comfortable, safety and feature-driven; to now being mobility connected. We want our cars to be extensions of our smartphones, secure environments, entertainment streams and personalized feedback mechanisms. The revolution may be coming with a roster of anticipated and unforeseen benefits. Uber was the first to jump in and introduce the first commercial autonomous (or self-driving”) car in Pittsburgh (of course they have to staff it for regulatory and legal reasons). 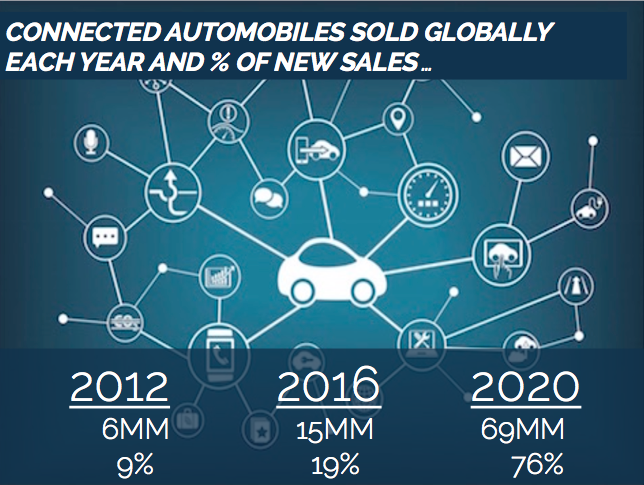 The bigger news is that in less than a full generation, more than 65% of cars on the road will be self-driving. 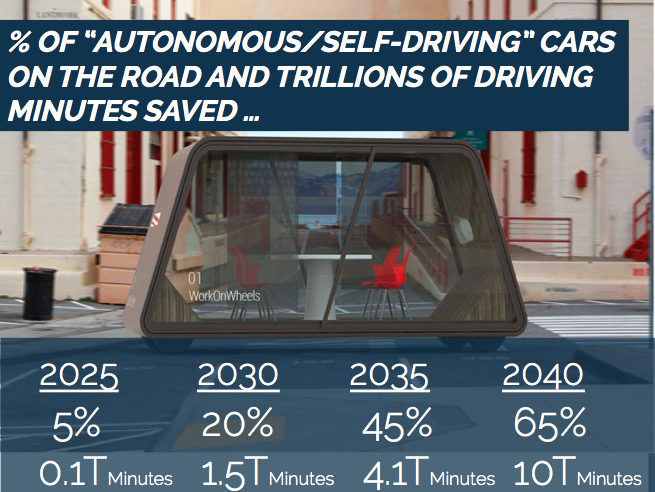 This will increase our amount of productive time (10 trillion minutes saved by 2040), and likely reduce our passion for gearing up on the “open road”. 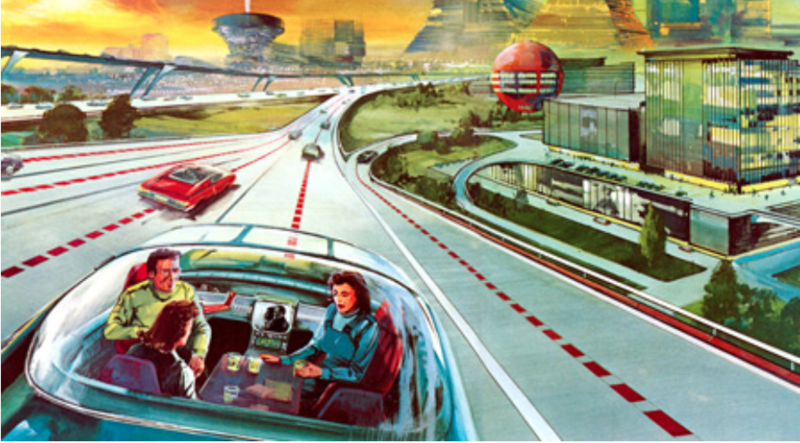 Think about the impacts on car design (see picture below for an IDEO concept vehicle of the future)? car ownership? on insurance? on traffic congestion? on light signals? and will truck drivers become the next secretaries, out of work due to technology shift? Perhaps this documentary was premature? Maybe we all are ready to give up the catalytic converter? 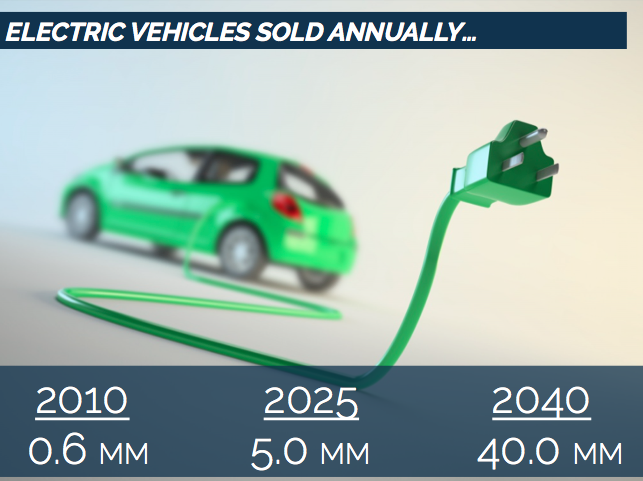 Even though we have frenzied lineups for Tesla’s new electric versions, imagine a 3o year period where we’ll see a 70x jump in electric cars being produced annually and the infrastructure to support it (battery life, charging stations, electricity demand and standards) to support it. 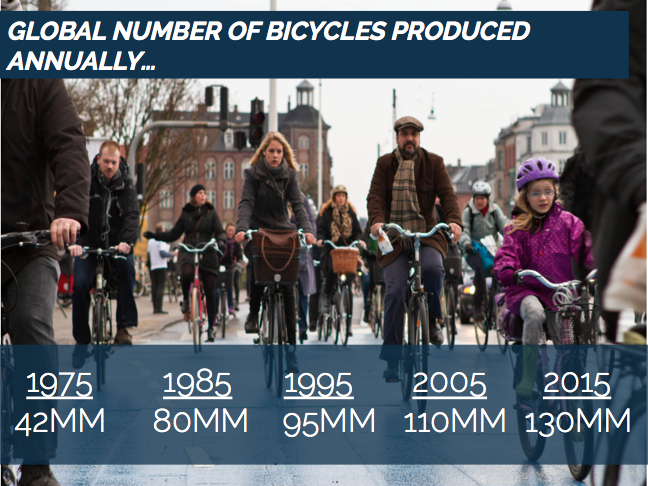 We have seen a tripling of bikes produced globally over a 40 year period. Driven by cheaper economics of bike production, increased paving, urban incentives and lifestyle preferences, it may be true H.G. Wells quote “every time I see an adult on a bicycle I no longer despair for the future of the human race”. But disturbingly, even though we can now own bikes, will we want to ride them? Even though most trips are within 5km, only 0.9% of all US trips are currently made by bike. Self-propelled, two-wheel fans and advocates, don’t despair – here are 10 countries to emulate. For the greater part of 50 years, it has cost the same amount of money to push tonnage into space, usually exhausting tonnes of highly propulsive gas and non-reusable rockets. 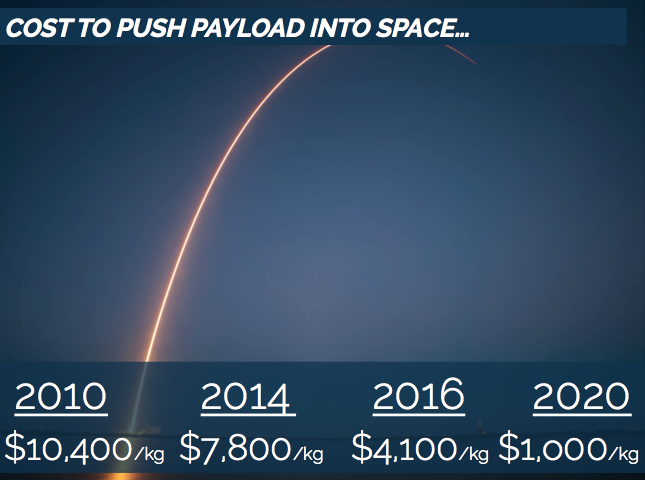 Given the push for Mars, need for economical satellite activity and privatized competition in the “space race”, we may be seeing space payloads that will be 10X cheaper to push into space soon and a return to mainstream excitement about space travel. Although Amazon Prime Air, Walmart and others have been rejected for commercialized delivery of mail and package delivery through drones, it may not be a distant pipe dream. Drones are being accepted as the next new holiday toy, but also increasingly for commercial uses. 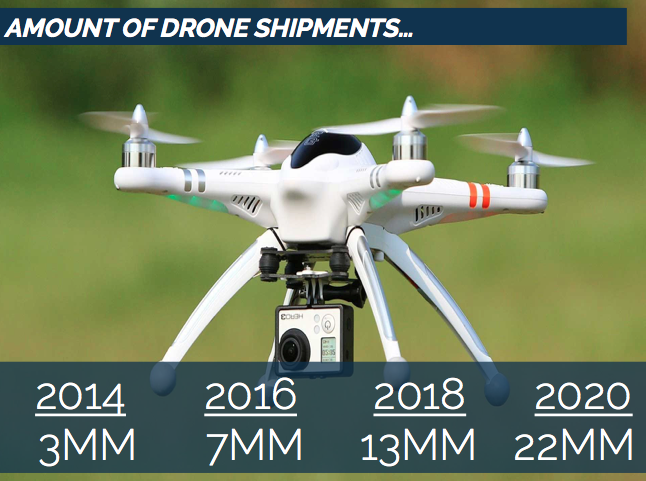 We anticipate 14X growth in annual shipments over a very short 6 year period. Follow or link to me for more Fast Forward Updates here soon, on my website SeanMoffitt.com and a new eponymous venture launching soon. As part of a personal and new economy manifesto, I have been compiling the best examples of a society, culture, business and technology that keeps getting sped up. It’s one thing to say it as a “throwaway line”, it’s another thing all together to find the evidence. I’ve been foolish enough to chase down various sources and work my way backward into history and forward into the future. The key takeaways – embrace change, don’t get stuck on one paradigm, experiment and fail/scale quickly and become a daily, life-long learner looking at what’s changing constantly. Fast Forward #1 – The Time We Spend on Digital Each Day (2008-2017)– yes it’s more than doubled over the last decade. Fast Forward #3 – The Number of Digital Devices We Connect To (2003-2020) – and since 6.6 is the average, many of us will have 30+ devices connected to us. Follow or link to me for more Fast Forward Updates here, my website SeanMoffitt.com and a new eponymous venture launching soon. 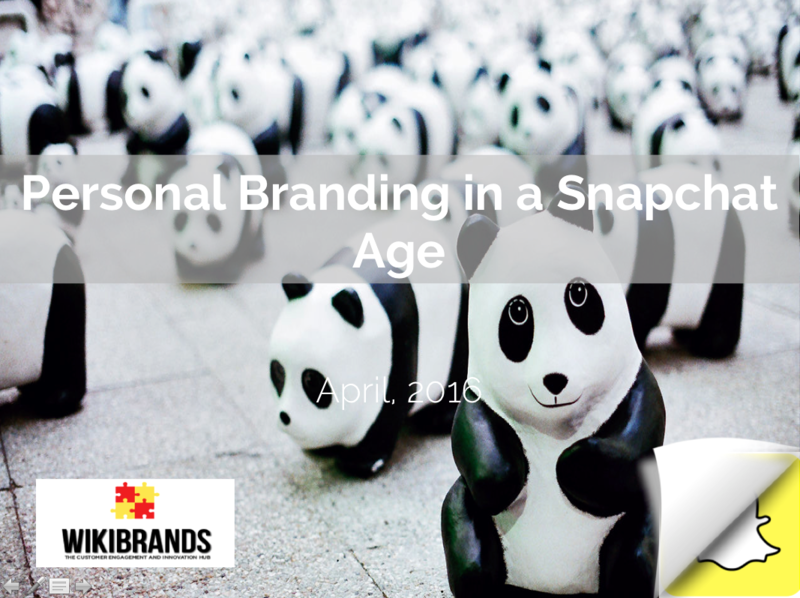 In association with Wikibrands and our upcoming presentation “Personal Branding in a Snapchat Age“, we are fielding our first survey pulse check on the role of Personal Branding. Most of my history has focused on how corporations, startups and organizations have built and incubated their brands, we’re wondering of the same rules hold for personal brands. How important is personal branding? and has it increased in importance? Are you even comfortable with the term “Personal Branding”? 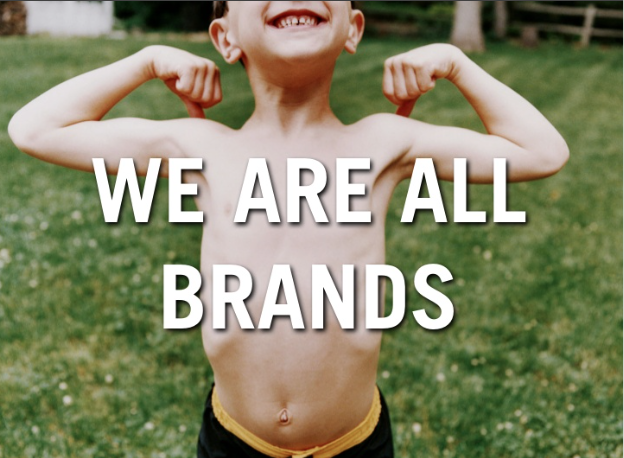 Do employers care about the value of your personal brands? Are you currently happy with your own personal brand? Top reasons to invest in your personal brand? Top positions/functions that can benefit from a strong personal brand? Key Personal Branding Success Factors? Key Personal Branding Media/Content Tools? Top Personal Branding Social Media Platforms/Tools? Most frowned-upon aspects of Personal Branding? in your opinion, the greatest and most horrible personal brands? 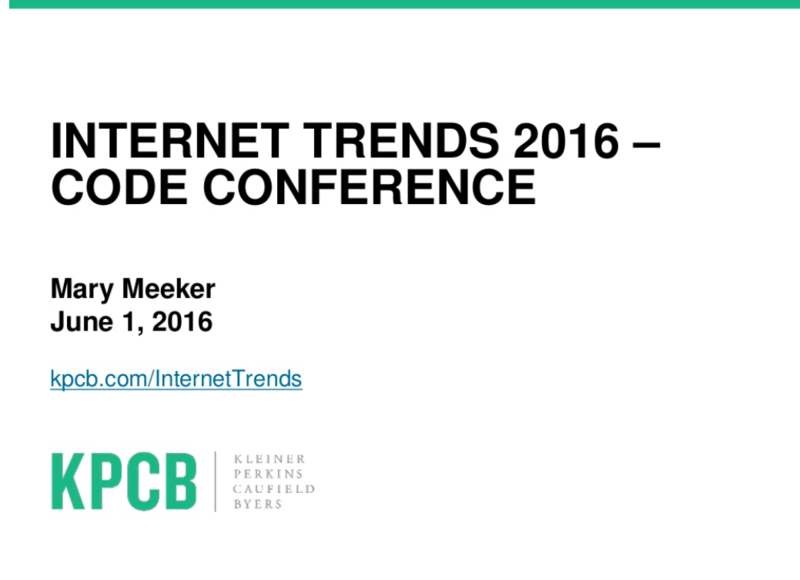 What forces will drive personal brands in the future? What are the best habits of great personal branders? We’ve had some great answers already, and we’d love your thoughts. 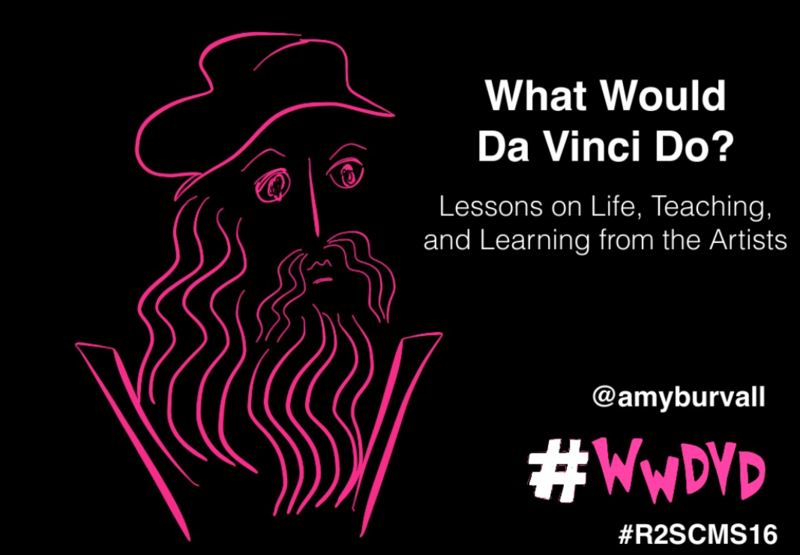 Hopefully you can grab 5-10 minutes and provide your insight. We will recognize and share toppling results with all respondents. Additionally, if you’re considering any type of content or event around personal branding, we are expecting results finalized at the end of April’16 and would love to collaborate. Please get in touch with us here. Depending on what role or function you have, this post may either make you squirm uncomfortably or scream with delight. Change does that to people. When business shifts happen, there comes a long enough period of time where smart people begin to say “I think we can manage this better”. 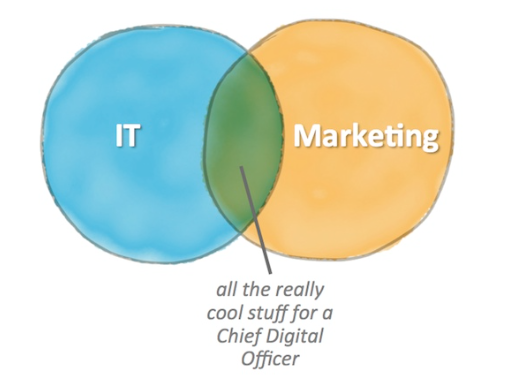 That’s exactly what’s happening between the widening and important gap being created between the marketing function and the Chief Marketing Officer (CMO) and the IT function and the Chief Information Officer (CIO). Top level executives and front-line staff are the first to admit that digital is not being managed well inside companies and things are falling through the cracks. Oftentimes, digital operations are lagging the expectations of their customers by 5 years (and in some laggard industries 10 years). it is leaving us open to market-disurpiting threats that aren’t on our radar. And boards and CEOs realize it’s time to do something about this technology conundrum – witness the “what keeps CEOs up at night” rise in technology’s importance. 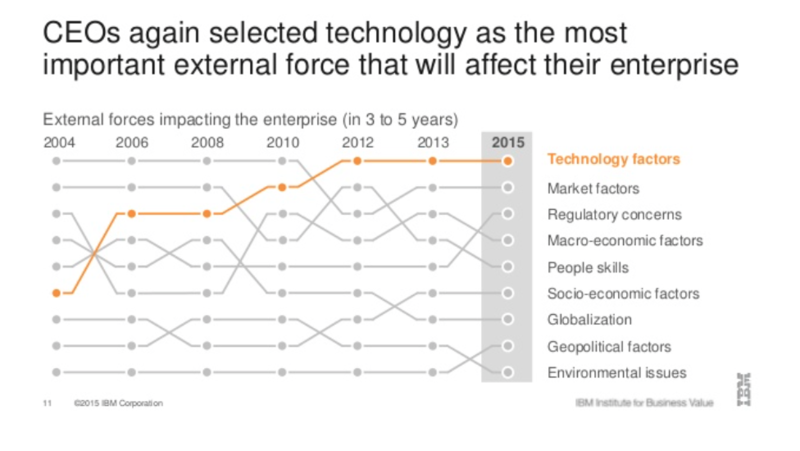 The IBM study above shows that many things have stayed the same in their relative importance spectrum but technology has zoomed to the top. Smart organizations have started to dedicate executive level resources to the challenge. 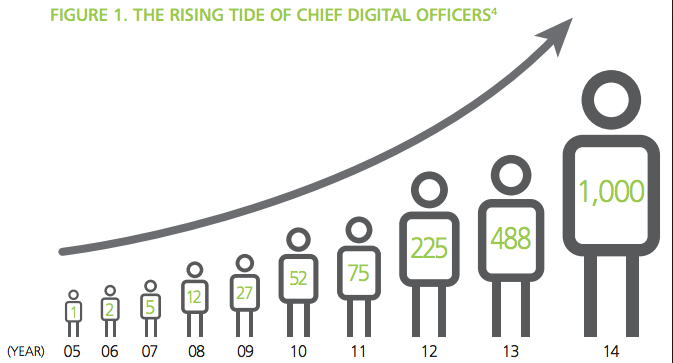 Enter the CDO – the Chief Digital Officer. At last count there were 2,834 of them on LinkedIn. Semantics of what we call the role aside, they are picking up the pieces from the often adversarial relationship between CMO and CIO. Think about it – you won’t have two more different personalities on an executive team then these two – the CMO and the CIO. Their reward for good work, risk motivation, stakeholder audience and academic/professional backgrounds are radically different. Marketers are accused of chasing the latest and greatest without accounting for the downsides, financial accountabilities and cultural resistance. IT people are accused of maintaining operational excellence at the risk of using technologies unfriendly to the customer experience and practices unfriendly to employees. A mess is being left in the middle. As a result, the trend is leading to a role that reports straight into the CEO. 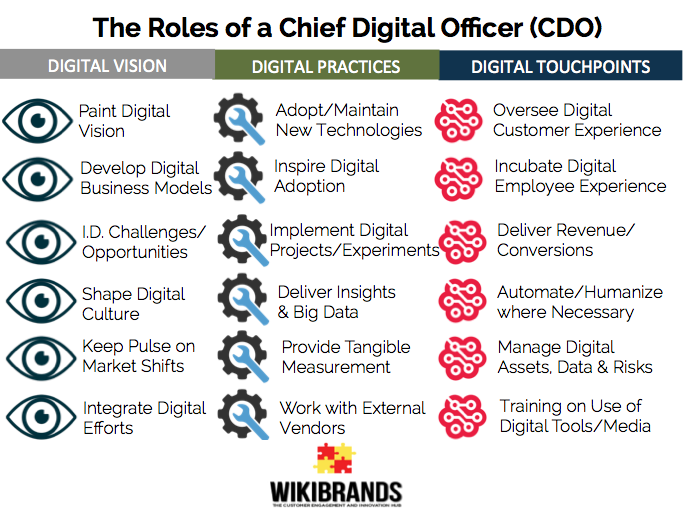 So what does a Chief Digital Officer do? 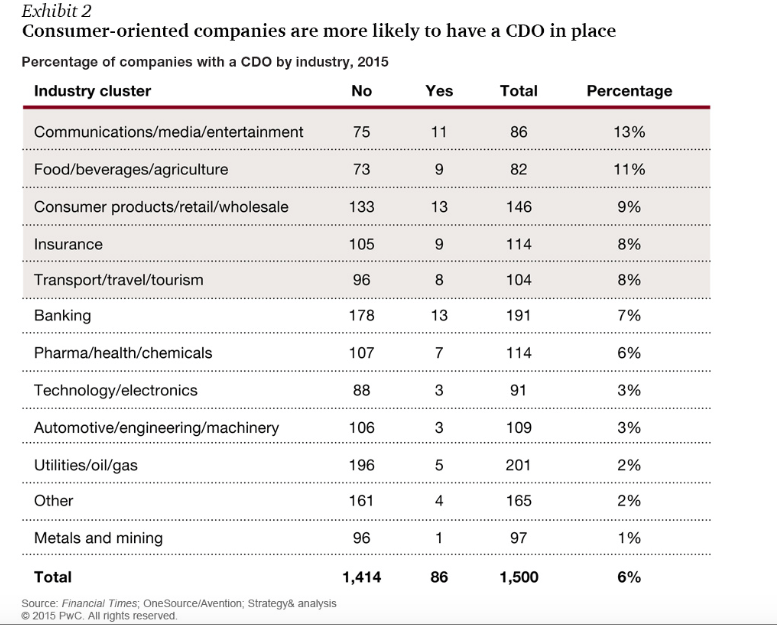 We have attempted to list the 18 things that CDOs could do to drive value into a business that currently are either: not being managed, being managed poorly or do not have accountability by other executives in the business. 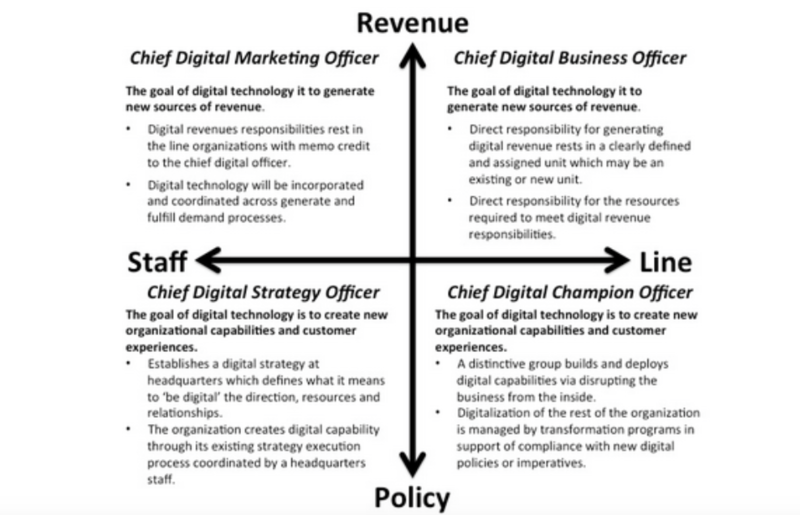 And directionally, there are four different sub-types of CDO role being created dependent on the nature of the business, the importance and strategic level expectations of the role, the external/internal focus of the role, the maturity level of digital inside the rest of the organization and capabilities that exist with other functions. However you construct the role, it does not appear to be going away anytime soon. 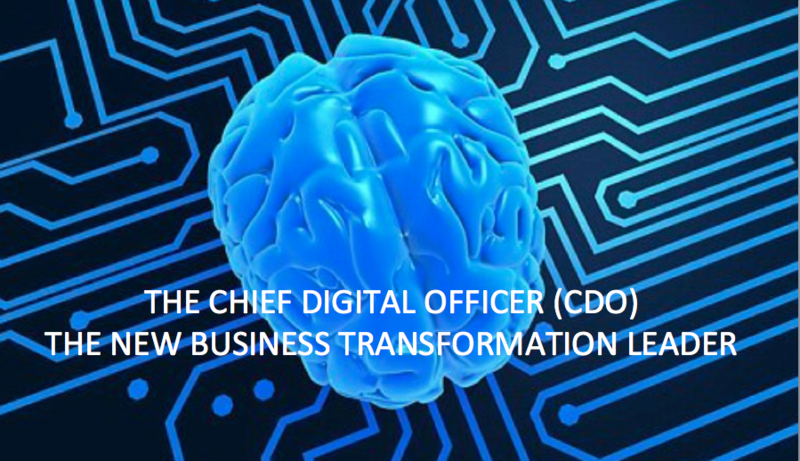 The role of Chief Digital officer is predicted to be in 50% of the largest global companies by 2017 and 81% of the top digital organizations already centre “digital strategy” as an executive level accountability. 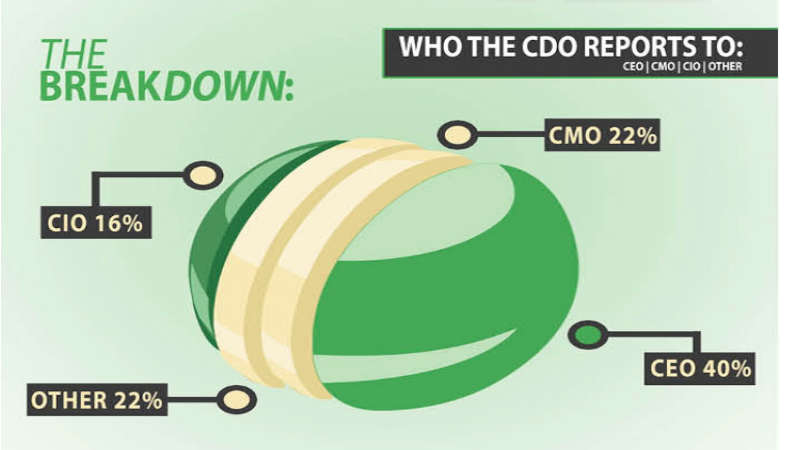 Change is coming executives, and it’s acronym is CDO.